Apply to affected vault of vaginal before sleep. Use 1 pill every other day. A normal treatment course need 6~9 pills. Inferior venter swell, lumbago, vaginal prickle, causalgia temperal low ferver, profuse leucorrhea. The symptom may disappear after cessation of therapy. 1. Don't use during menstruate. 2. Be abstinence during therapy. 3. Don't take hip bath during therapy. 4. Don't use in pregnant and baby-nursing women. 5. The drug may melt if temperature is higher than 30ºC. Store at 2~8ºC before use. Interferon alpha 2b exerts actions of antiviral and regulating immunity. Such immunomodulation activities include enhancement of the phagocytes for targets cells, and enhancement of the NK cells activities. 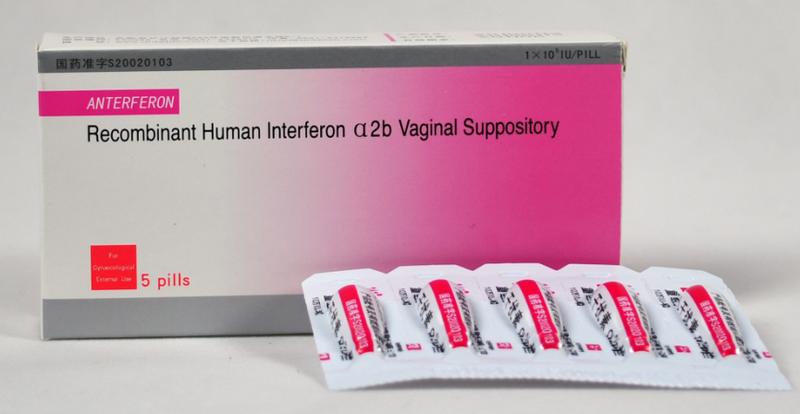 There is no study on this term, please see The Pharmacokinetics Instruction of Recombinant Human Interferon alpha 2b for injection for reference: Cmax of Anterferon is serum occurred at 3.5~8 hours after intramuscular or subcutaneous injection; the half-life of clearance is about 4~12 hours. Kidney is the main organ of clearance. Biliation and metabolism in liver are also important way for elimination of interferon. More than 80% interferon can be absorbed via intramuscular subcutaneous injection. Ankebio Building, 669 Changjiang Road, West ,Hefei, 230088, P.R. China.